This Halloween, help your kids recreate one of the smash hit films of the year with our Narnia costumes. In Narnia, animals talk, magic is common and good battles evil. What better setting from which to draw Halloween inspiration? Boys will love to act out movie stud and hero Prince Caspian. 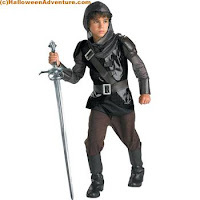 Our Chronicles of Narnia Prince Caspian Costume takes inspiration straight from the movie screen, so it’s guaranteed to leave your child totally satisfied with his costume choice! Includes: Tunic with attached hood, attached shoulder pieces, attached belt, and pants. 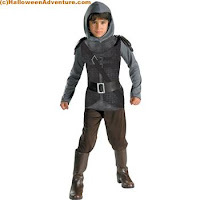 Take it a step further with our Chronicles of Narnia Prince Caspian Deluxe Costume. Much like the original Caspian costume, this one is taken straight from the screen, but includes eve more goodies. Costume comes with Tunic with attached hood, chest belt, shoulder pads, pants, and belt. This one is for a real warrior. If Caspian’s not his style, try our Narnia Peter War Outfit. Sometimes the best warriors come about from the most normal of children. 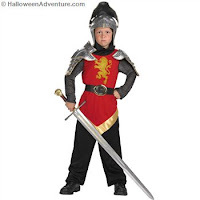 Includes a deluxe polyester red shirt with golden lion emblem on the front, faux chainmail sleeves and sewn in tabard, deluxe silver helmet with visor, two silver shoulder guards, black sewn in belt with golden metal buckle, and black pants. For more movie costume ideas, visit Halloween Adventures online catalog! Halloween is almost here, and costumes are selling out fast, so make sure and get your favorite one before it’s too late!